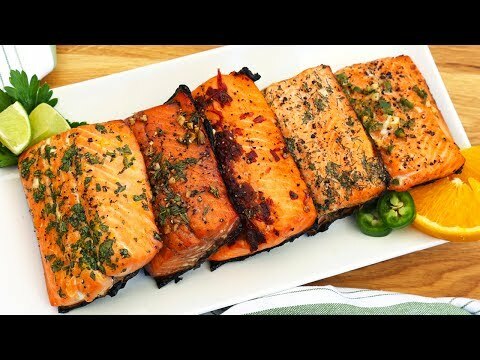 ﻿ 5 EASY Salmon Marinades! In a small bowl, whisk together orange zest & juice, ginger, honey and salt & pepper to taste. Place salmon and marinade in a large zipper bag and allow to sit in the refrigerator for 20 minutes. Place salmon on a nonstick or parchment lined baking sheet. Bake at 400ºF for 10-12 minutes or until salmon is cooked through. In a small bowl, whisk together herbs, lemon zest & juice, garlic, oil and salt & pepper to taste. Add marinade and salmon to a large zipper bag and allow to sit for 20 minutes in the refrigerator. Place salmon on a nonstick or parchment lined baking sheet. Bake at 400ºF for 10-12 minutes or until salmon is cooked through. In a small bowl, whisk together pineapple juice, jalapeno, garlic and cajun seasoning. Season with salt and pepper to taste. Pour marinade over salmon and refrigerate for 20-30 minutes. When ready to cook, add salmon to a nonstick or parchment lined baking sheet. Bake at 400ºF for 10-12 minutes or until salmon is cooked through. In a small bowl, whisk together balsamic, maple syrup, garlic and thyme. Season with salt and pepper to taste. Allow to marinate for 20-30 minutes in the refrigerator. Place on a nonstick or parchment lined baking sheet. Bake at 400ºF for 10-12 minutes. In a small bowl, whisk together chipotle in adobo, lime zest & juice and agave. Season with salt and pepper to taste. Place salmon in a large zipper bag and add marinade. Refrigerate for 20-30 minutes. Place marinated salmon fillets onto a nonstick or parchment lined baking sheet. Bake at 400ºF for 10-12 minutes or until salmon is cooked through. The marinades i use on my chicken...healthier alternatives for salad dressing..